Congratulations! You’ve done a good job of getting the word out that your organization needs volunteers, and you’ve had 20 people submit applications. Now you need to choose one or two for specialized jobs, while the rest will be moved into more general work categories. But how do you choose the best-fit volunteer for the work you need to do? After all, you don’t know if they’ll fit in or handle the job until they begin. Here are a few ideas to help increase the odds in your favor of picking the volunteer of your dreams! When conducting the volunteer interview, remember to keep emotions and feelings out of the process. You’re not interviewing for a new friend. Try to avoid allowing the chemistry between you and the potential volunteer—even if it’s great—be your sole decision-maker. It’s wonderful to get along well with volunteers, but even more important to determine if they have the skills to do a good job. Speaking of skills, try to remain open to different sets of skills and new ideas—even if they weren’t what you had in mind for a particular position. You may find you need skills you haven’t identified. Consider administering personality quizzes designed to help you place volunteers in the types of positions they’re best suited to. An introvert might not want to approach potential donors during fundraising time, for example. Going through these exercises can help you determine which potential volunteer you should bring in, as well. Finally, a thorough background and credit check can help you make a final decision. A volunteer who looks fantastic on paper, but has been convicted of theft, may not be a great fit for your organization—especially if there is money handling involved. And if your organization serves vulnerable populations, you’ll want to be sure to keep them safe by completely screening each potential volunteer. Call references, as well. Ask the potential volunteer to explain any discrepancies between their application and what references say. Finding the right volunteer is worth the effort—especially when they get right to work for your nonprofit organization! The National Council on Aging is embarking on a multi-sector partnership initiative to increase the numbers of senior volunteers, with the goal of engaging generations to help each other. With help from the U.S. Administration on Aging, Atlantic Philanthropies, MetLife Foundation, and Corporation for National and Community Service, the NCOA is working with local organizations to create model older adult volunteer programs to share with other organizations in their communities. Included are model programs for grandparents raising grandchildren; parents raising children with special needs; and caregivers of frail older adults. Identifying these four common characteristics of exceptional older adult volunteer programs makes it easier to create standards that other non profits can mimic for better chances of success. Six organizations from New Jersey to Oregon were awarded grants to help them replicate their programs in their communities. Yesterday, in Washington, DC the MGCE summit took place, where the organizations shared their successes and plans for the future. Innovative, cooperative programs like this are just what non profits need to help them deliver services to meet expanding needs. Whether you are a non profit organization executive director, volunteer coordinator or HR manager, you may be in the position of recruiting volunteers at some time. Just as salespeople are always selling, those who work in non profits are always recruiting volunteers. Whether you’re recruiting your first or your one hundredth volunteer, these four steps can help you be more successful at it. Be sure you have a position description for each volunteer position needed. Writing a description will focus your thinking on exactly what duties you need performed, what skills and knowledge it will take to perform the job, and what training you’ll need to offer. You may decide the position can’t be filled by a volunteer—and it’s better to discover that before you start the interview process. Write up a recruitment plan. You’ll find it much easier to find the right volunteer if you look in the right place. For example, if you need an event coordinator, you probably won’t send out a general “volunteers wanted” posting to your email list. For such a specialized position, it might be better to tap into a personal network of qualified individuals. For help with parking the evening of the event, a more general appeal on your NPO’s Facebook page will probably suffice. Plan the interview. Being organized and professional will demonstrate to the candidate that you take their volunteering very seriously. Prepare questions that relate directly to the position and its responsibilities. Ask each interviewee the same set of questions, and don’t ask anything that is prohibited by law, such as marital status, religion and family-related questions. Expand the usual list of questions. The interview is the only time you’ll have to get to know a candidate before you make a decision. A wide variety of (lawful) questions may help you screen out individuals who may cause harm to the organization. Of course, the interview should never take the place of a thorough background check. Preparing with the right questions can help you ascertain whether an individual is a strong communicator, is willing to learn, has a commitment to the program, or is suited to working on a team. Thousands of volunteers are helping the people who were unfortunate victims of last week’s devastating Alabama tornadoes. And plenty of volunteers are also stepping up to help the estimated 7,000 dogs, cats and horses injured or displaced from their homes by the storm. Like humans, animals have suffered much throughout the South, and especially in Alabama. Exacerbating the problem is the great number of veterinary practices that have been destroyed, along with tens of thousands of homes and other businesses. Animals have been separated from their people, who may be in emergency shelters—or worse, may not have survived the incredibly destructive tornadoes. For survivors separated from their pets, the worry can add tremendous insult to injury. Anyone who loves an animal can imagine how awful it would be to survive a storm or other disaster, only to discover a beloved pet is missing. Luckily, dedicated volunteers who understand the human/pet connection are stepping in to reunite pets with their people, as well as to make sure that any injured pets needing care are getting it. Veterinarians are volunteering to care for animals, no matter whom they belong to, or who will or will not pay for their treatment. Relieving human suffering is most important after a disaster like this. But helping the animals that belong to those humans is important, too. For people who have just been through incredible trauma, it’s extremely difficult to not know whether their pets are okay or even alive. Helping these pets helps their people. Besides, preventing hundreds of cats and dogs from roaming the streets, looking for their owners and becoming more frantic each day is a worthy effort in itself. 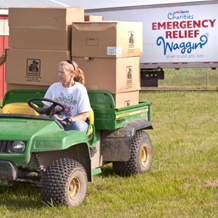 PetSmart’s Emergency Relief Waggin’ program sends pre-loaded semi-trailers to help pet victims of natural and manmade disasters. Filled with $60,000 worth of crates, bowls, leashes, food, cat litter and more, the trucks are quickly deployed to help in areas where they are needed. For information on how to help, visit www.PetSmartcharities.org/emergency-relief.